#Cygwin in simpler terms is a bash shell for #Windows. You can run all your favorite bash tools like #rsync, #ssh, etc in cygwin. Turns out, you can run #powershell also. Yes powershell! Simply type “powershell” in cygwin, no quotes, and you will enter a powershell environment. 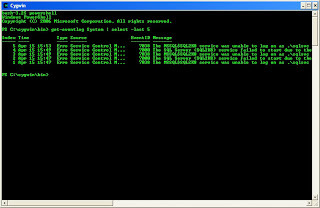 Else, you can type a full command like this >powershell “get-eventlog System”. At the end you will be brought back to bash shell. In the first example you will stay in powershell. One caveat though, I don’t see tab completion in cygwin and file names are case sensitive, so you must specify the names exactly how they’re defined. Never do this in PowerShell! Fix for infamous Oozie error "Error: E0501 : E0501: Could not perform authorization operation, User: oozie is not allowed to impersonate"